As a young girl growing up in Sierra Leone there were certain snacks you would expect to be served when invited to a party. One would expect to be served jollof rice and or cous cous, prawn crackers, salad, pepper chicken and fish balls crumbed with colored Paxo breadcrumbs. If your plate was missing one of these then the party wasn't "posh" at all and laudie, laudie you were at the mercy of the congosa people (gossipers) for the next week hahahahahahaha. Be warned these fish balls are very tempting and I can totally understand why someone would be disappointed if they had prepared their appetite for this flaky on the inside, crunchy on the outside fishy goodness. Seriously, I would lose it big time and even roll on the floor when I got home or better still cry myself to sleep. Now I have made it easy for you to go ahead and prove me wrong and don't go blaming me when you become hooked. The ingredients I used are: 1.5kgs blue grenadier fillets (or any white fish of your choice), 1 large Turkish bread, 2 medium sized potatoes, 1 medium sized brown onion, 2 eggs, 4tps milk, 1tsp each of garlic powder, black pepper, chilli powder and chicken stock powder and oil for frying. You can use any store bought breadcrumbs but I prefer making mine so I can add the food color to make it all pretty. 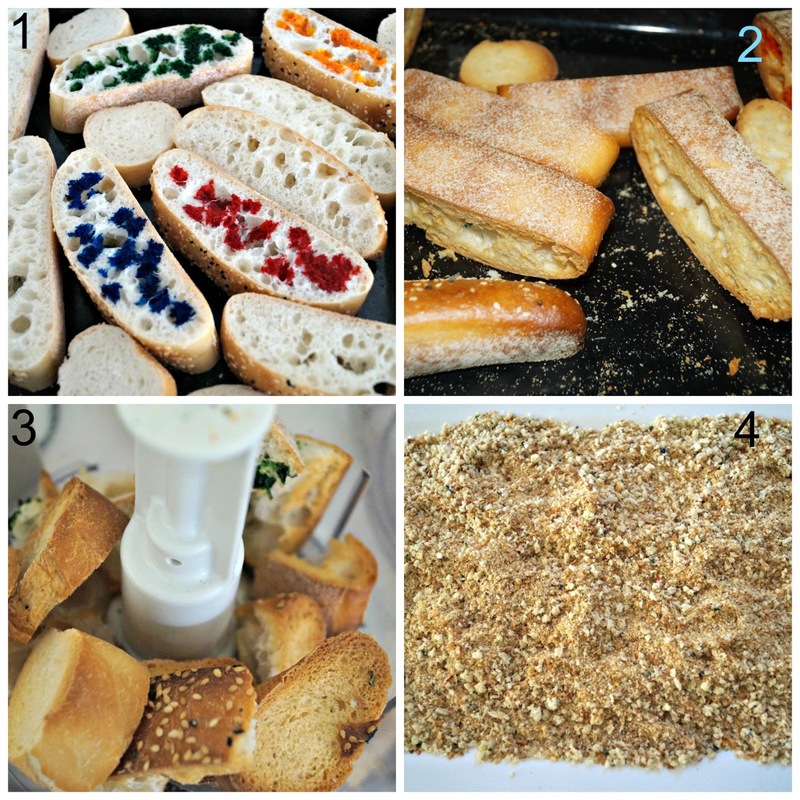 To make the bread crumbs, cut the Turkish bread into pieces, add food color as shown in 1 above. Then bake in preheated oven at 150C for 25 minutes or till its golden and crunchy as shown in 2. Break into pieces and blend in food processor as shown in 3, then spread out on a try as per photo 4. Boil the potatoes in salt water till tender then peel. Now add blended onions, garlic powder, chicken stock powder, chilli powder, potatotes, black pepper and salt to taste. Using a fork, smash the potatoes, then mix it all through the fish and other ingredients. Drain on paper towel and serve. Pretty and delicious. Labels: African food, Food, Recipes, Sierra Leonean recipe, thecookingwardrobe, West African Recipe. Elsie can you move to San Francisco already? Jeez this is the ish. I'll try to make it but it wont turn out like yours but I will try. No scratch that, I must try this. I'm such a foodie and if this does not take you to food heaven then I don't know what will. Happy Sunday babe. It is like making turkey meatballs, but a little bit more sophisticated. They look so delicious! LOL @ the gossipers! Oh My! I'm already salivating. They are so yummy. Thanks for the step by step process. I hope to recreate this someday. can you bake instead of frying? Ooooooommmmmyyyyy goodness. My appetite for it just grew immensely now. I am a very very big fan of this appetiser. Anytime I go to parties this will be the first thing I am the lookout for and grabbing as much as I can because I know I won't get the chance to have seconds when everyone noticed it on the table(I know this is bad but we I do it). I will definitely try it for my self and whenever i visit Perth I will put in a request for these bad boys.